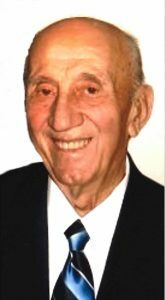 Edmund J. Havlovic, 90 of Prague, died Thursday, December 1, 2016 at david place in David City. Mass of Christian Burial Monday, December 5, 2016, 10:00 A.M.
Edmund was born November 11, 1926, on the family farm near Prague, Nebraska, to Antonand Anna(Vyhliidal) Havlovic. He attended school in the area and in 1945 was drafted into WWII, in the United States Army. On September 27, 1958, he married Betty Kubr at St. John's Catholic Church in Prague. They lived and farmed southwest of Prague. Edmund also worked for Shangrilla Homes in North Bend, Kingery Construction of Lincoln as well as farming. He served several years on the School Board for District 19, was a member of Prague Legion Post #54, lifetime member of Ss. Cyril and Methodius, loved antique tractors and had his own Polka Band, the Jolly Czechs. He is survived by his wife, Betty of Prague, four sons ;Dallen of Lincoln, Daniel and Annie, Duane and Rachelle and Doug and Kelly, all of Prague, son-in-law, Dan Cihal of Valparaiso, a sister, Adeline Pabian of Phoenix, 12 grandchildren; Andy, Holly, Debi, Kari, Ryan, Brittaney, Nicole, Mikala, Kelsi, Tyler, Trevor and Morgan, 10 great-grandchildren;Ethan, Alyssa, Hailey, Hudson, Noah, Ava, Lexi, Brayden, Taytum and Madison. He was preceded in death by his parents, daughter Marnita Cihal, sister Agnes Polacek and brother Joe Havlovic.